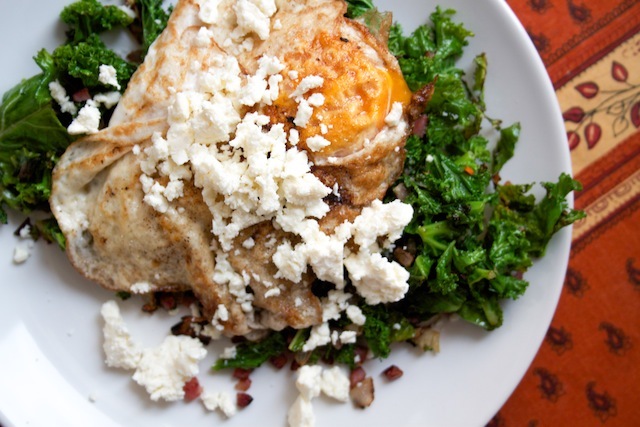 Show Me the Green: Wilted Kale with Feta and Fried Egg – Eat Me. Drink Me. Apparently I have a reputation for really liking kale. I don’t know where it came from or what I’ve done to start it, but my love is apparently well known. I’m not ashamed. I do love kale. I’m hitting the talking-about-kale bandwagon a bit late. 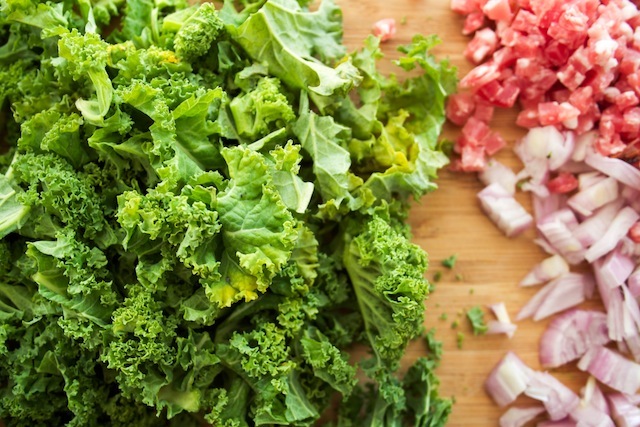 According to the internet, kale’s trending days have come and gone – it’s so last year’s green. (Although The Guardian seems to think that kale popsicles are going to be big in 2014…) But I don’t love food because it’s trendy; I love it because it’s delicious. 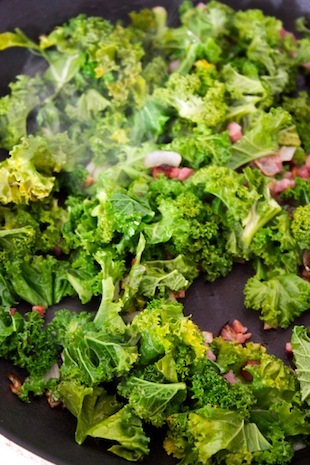 I love the way crisp and chewy kale plays off shaved parmesan, chopped dates and lemon dressing in a raw salad, the way the curled leaves trap salty pancetta bits, the way a kale chip crunches apart in your mouth, or the way a bitter wilted leaf is the perfect foil for chili flakes and a soft, rich egg. That’s what I want to talk to you about right now. The perfect combination of flavors: The heat of chili, the bite of briny feta, the warmth of a fried egg and the all-things-are-better-with-bacon quality of bacon supported by a base of hearty green. Kale makes all this possible. I first discovered this magical combination (or at least the basics of it) back in 2009, when this blog was in its infancy and I was just starting to shop and cook regularly for myself. Of course I wrote about my discovery back then, and of course I didn’t have the consideration to write down the recipe. (The gall. The gall.) So I’m making up for the error of my ways now, and sharing a dish that’s seen me through a lot of tight budget days and a lot of lazy lunches. Cheap, tasty, and quick. Gimme those greens. This little recipe only serves one, so if you’re making brunch for a bunch (get it? 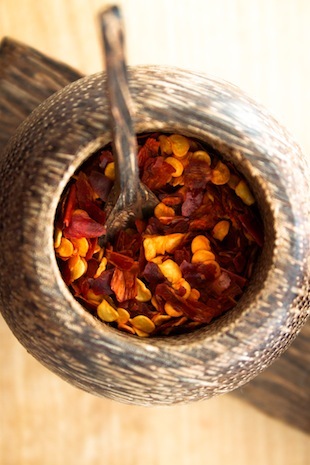 ), you’ll want to increase the quantities of these ingredients accordingly. 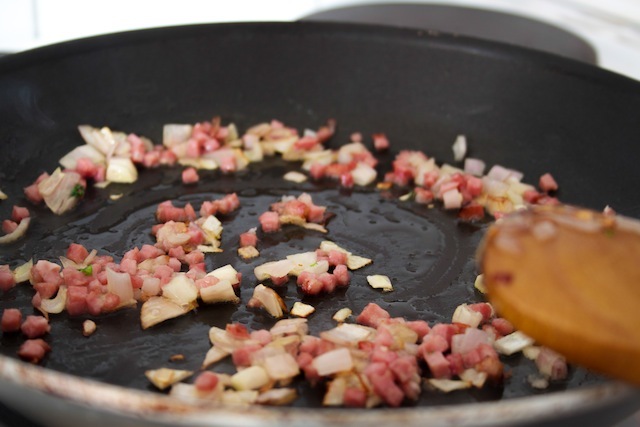 Sauté chopped shallot and bacon in olive oil until the shallots are translucent and the bacon is cooked through, but not yet crispy. Add kale. (Make sure that you’ve removed the tough central stem of each kale leaf before you chop it up.) Add chili flakes, salt and pepper and stir the kale until it’s wilted and cooked down to about ½ of its original size, about 7-10 minutes. Transfer the kale to a plate. In the same skillet, melt butter, then crack in an egg. Fry the egg to your own special specifications. I like mine over easy with the yolk still runny. 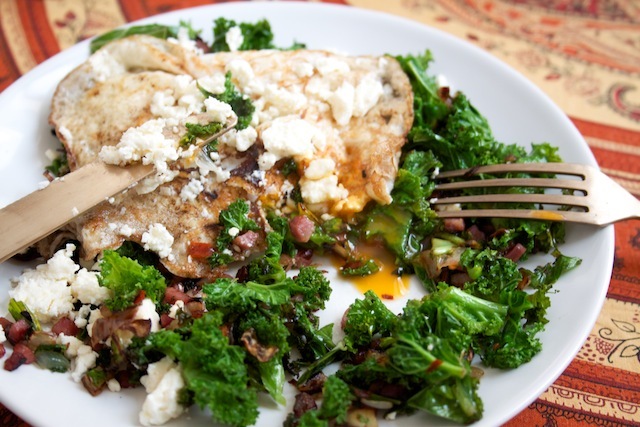 Flip the egg on top of the kale and finish the dish with plenty of crumbled feta. Add salt and pepper if needed. Also great with crusty French bread. Ok. All I have to do to make this for tonight’s fast dinner is substitute fresh spinach (I just can’t get a get liking for kale although G’pa does),leave out the bacon and substitute Eggbeaters and garlic oil, and presto – I have the same dinner, with Fat Free Feta cheese. Thank you. I love to hear that a recipe I post inspires a new dish!